William Barnard is an interesting clockmaker, but one who can be baffling in some respects. His work is of fine quality, his movements are beautifully made and consistently well finished, his engraving is sharp and clear, his dial style is always very much up-to-date and over a long period, his cases are of consistently similar style. From a cursory glance at his clocks we can tell that this was no hit-and-miss clocksmith, who was handy with a with a large hammer, but a man who knew exactly what he was doing and who was doing it in a most professional way. And so he should, for he was trained by one of the best makers of his time, Daniel Tantum, by whom only a day or two ago I saw a magnificent six-tune longcase with a globe moon in the arch, which is something very few makers can claim to have put their names to. And yet ........ there are things about his clockmaking which are puzzling and seem at first sight to be inexplicably random. In particular we see that some of his clocks are not signed on the dial, but are signed secretly in some hidden place in the movement or behind the dial. We see some of his clocks which are numbered on the dial in a regular sequence, and some which are not numbered at all, as well as some which are numbered in a hidden place inside the movement. I can't imagine this is just down to his being disorganised. William Barnard was born at Newark in Nottinghamshire in 1708, was apprenticed to Dan Tantum in Nottingham town in 1724 for a period of seven years at a 'premium' of ten pounds, this being a fee his father had to pay for the privilege of the apprenticeship. The higher the reputation of the clockmaker, the larger the premium he could ask. When William Barnard himself took apprentices later in life, he charged a premium of between £10 and £15 a time. We see considerable variation even in the premium charged by the same clockmaker, and I always have the impression that a clockmaker would lower his premium for a lad from a poor background if he had made a particularly good impression. Ten pounds was not unreasonable. On the topic of premiums I am put in mind of the case of Ahasuerus Fromanteel, the celebrated London clockmaker who introduced the pendulum into England in 1658. After the death of his first wife, Fromanteel had married the widow of a wealthy Colchester cloth merchant, with probably some sort of marriage agreement that he was not to get any of the moneys of her late husband. But it seems that he did, and her late husband's brothers brought a court case against him in 1664 for over £600, a case which lasted on and off with interruptions during the Great Plague and the Fire of London, and still they persued him for the return of such moneys, until one particular court of 1666, where he proved himself the canny fellow we would expect him to be. He totted up everything he had spent since the marriage on his stepsons and wanted that deducting from such moneys, including the fact that he had taken one as his own apprentice ' for which he deserveth to have £20 for he has not had less from any apprentice during the last twenty years'! Twenty pounds in the 1660s was a high premium, which makes William Barnard's £10 of sixty years later look very reasonable. 1. 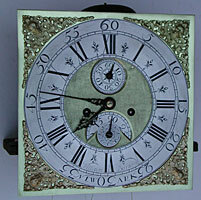 The dial of this eight-day clock is signed 'William Barnard NEWARK' but has no number, either on the dial or anywhere else inside. Half-hour markers and larger calenday slot are early features. Date 1730s. We deduce that William Barnard finished his apprenticeship in 1731. The following year Tantum moved from Nottingham to Derby to take over the business of his father, and I think it was then that Barnard moved back to his home town of Newark to set up in business. By 1742 when he married he would have been well established. But in the early 1730s, when he first set up in business, which he ran for over fifty years till his death in 1785, he was competing in Newark with existing clockmakers who were long established, the Gascoigne family. We can imagine that in his first few years he would have been struggling to make a living. It might even be that he worked as a journeyman for the Gascoignes, but we cannot say for certain as there are no records to document such things. Whatever the reason, we do know that he sold some clocks without any signature on the dial. But to do this is not compatible with a man newly set up in business and keen to advertise his wares and promote himself to the utmost. We might therefore deduce that he was at this time deliberately concealing his identity, rather than promoting it. This practice is occasionally seen with other clockmakers, especially in their earlier years. There are two possible reasons I can think of that may account for it. If he was working for another master, such as the Gascoignes, whether in their premises as a full-time employee or in his own workshop as an 'outworker', they would not have allowed him to make and sell clocks openly under his own name in direct competition. The lack of signature implies that he was doing this secretly. The other reason is that, if he found trade very sparse at first in Newark, he might have decided to try his luck at selling clocks in the markets of local towns - like Nottingham. We know he kept up his regular connections there as he married not once, but twice, in Nottingham, which is some twenty miles distant, and which was a much larger city offering a far larger potential clientele. But not being a local trader he would have been forbidden by local by-laws to sell his goods in the market at Nottingham or at any other larger town. We know that when rural clockmakers did flout the law and trade in local market towns they often left their clocks unsigned, to help avoid detection later. This then is the likely reason some of his earlier clocks are unsigned. If he took a clock to market to sell, he would be likely not to sign it. A third reason for clocks without his signature on the dial could be if he was making them to sell wholesale to others, such as jewellers or silversmiths, who would retail them in their own shops and would not want Barnard's name up front. 2. The oak case of the un-numbered clock is of a style which Barnard used with little change for many years. The bull's eye glass lenticle is an early feature. At some time fairly early in his working life William Barnard decided to number his clocks. Quite a number of clockmakers did that, and it stands to reason that they did not decide this at the day of birth, but at some point in their careers, quite possibly after they had already been working for a number of years. Maybe they were influenced by the fact that they had seen serial numbering on the clocks of other makers which they had worked on, and thought it was a nice idea they would adopt. So it would not be surprising if we found some makers whose earliest clocks were not numbered, but whose later ones were. I can think of several clockmakers this applies to. And it seems to apply too to William Barnard. I have jotted down the numbers of his clocks I have come across over the years, which are: 248 (*), 298, 277 (*), 384 (*), 424 (also numbered inside 794/44), 525, 531, 535, 549, 565, 566, 587, 591, 613, 627, 681, 706,729, 772, 797, 807, 816, 819, 827, 835, 901, 910, 921, 933, 957, 969 (dated 1769), 1005, 1084, 1086, 1092, 1099, 1189, 1200, 1204, 1207, 1216, 1236, 1663, 1753 (or 753?). We don't know which year he began numbering but we do know that a few clocks are without numbers, which implies that it was not at the very beginning of his working life, as we can assume that once he began numbering he carried on with the series. Clocks without a visible signature would, we might expect, have come before clocks signed on the dial. Clocks without numbers would come before those with numbers. This would all seem very straightforward and rational. We might expect some of the clocks from early in his career to be unsigned, and might expect these would be followed by some of his earlier signed clocks which were un-numbered, followed by signed clocks which are numbered. What we find in fact, from the few examples we know of, is that some of his earlier clocks are signed but un-numbered, and some of his unsigned (on the dial) clocks, which we might expect to be the earlier, are numbered! We have scant records of those clocks of his which are not signed on the dial, probably for the simple reason that they would often go unrecognised as being by him. Only a keen student of clocks or maybe a restorer would be likely to see such a hidden signature. Clock number 248 pictured here is just such a one, having his signature concealed but yet numbered behind the movement backplate. Yet we also have examples of clocks made before he began numbering, yet these are signed. So how do we explain that? 3. Pillars attached to the hood door and side windows are a feature of his earlier cases. I can only think that if he sold clocks in a local prohibited market town, he would leave them unsigned, and these are likely to be amongst his earliest clocks. But if he took an order in the market for a clock to be delivered to the client's home later, then he would in all likelihood sign it on the dial. In this event we would see an occasional early one with a dial signature dating from the same period as some without a visible signature. We cannot yet calculate when he started his numbering system, but I feel sure than once he did begin it he would have carried on the same numbering series. In the series of numbers listed above, those marked with an asterisk had the number hidden on the back of the movement. This implies that he later adopted the idea of displaying the number on the dial. He often set the serial number within the seconds circle, where it barely shows. I have spoken to owners who have had a Barnard clock for years and never before noticed that it had a serial number. But, setting the topic of signatures and numbers apart, William Barnard was an excellent and prolific clockmaker, whose work is a delight to see. His father's £10 premium was well spent! Footnote. This article was published in a fuller version in Clocks Magazine.